Actress Sonam Kapoor Ahuja met with Hollywood actress Mindy Kaling and called her “impossibly sweet, funny and smart”. 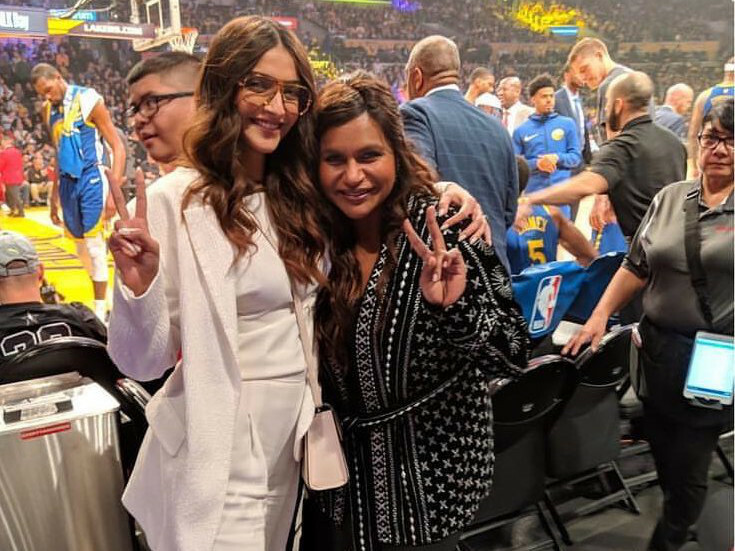 On Tuesday, the Bollywood star and her husband Anand Ahuja attended their first Lakers game in Los Angeles when they bumped into the American actress. The ‘Neerja’ actress took to her Instagram and shared a photograph of herself along with the Kaling. The two actresses are seen smiling as they strike a pose for the camera. “So last night at the game I got to meet and hang out with one of the coolest people I’ve ever met Mindy Kaling she’s impossibly sweet, funny and smart. Also thanks Anand Ahuja for taking multiple pictures of us,” Sonam captioned the image. On the professional front, Sonam is all set for the release of her film ‘Ek Ladki Ko Dekha To Aisa Laga’. Directed by Shelly Chopra Dhar, the movie also stars Anil Kapoor, Rajkummar Rao and Juhi Chawla in lead roles. The is set to release on February 1 in India. Apart from this, she will also be seen in ‘The Zoya Factor’, based on a similarly titled novel by Anuja Chauhan and which features Dulquer Salmaan as the male lead.